As an artist, I consider art on a sort of spectrum in my mind by the manner in which it is rendered. I picture two opposing ends: one a chemist, who has a pristine lab and measures everything in the most precise manner, conducting experiments in a white coat with the thinnest of pipette, a Bunsen burner, and a notepad to meticulously record results. On the other end is the nudist, someone completely of the body who paints without a trace of inhibition, who never decides what to put on the canvas in advance but just instinctually slathers it on with a huge brush or spatula, perhaps even while sipping a glass of wine with the other hand, all while naked. In my mind I call the two types of artists "The Nudist and The Chemist." With every painting, I fall somewhere in between--with "The Nudist" being my ultimate goal as an artist, like Howard Hodgkin or perhaps the elder Matisse, working in bed into his eighties with yards of fabric, sunglasses and a big pair of scissors. LEFT: Ethan Murrow, "Lava Collection - Well I definitely heard something" graphite on paper 54"x54" 2005. Murrow and his wife Vita Weinstein develop plots and film their stories, and then Murrow searches for frames worth portraying by hand. His upcoming show "Dust Mining" debuts March 15th and is his most ambitious to date. Kimberly Brooks: One of the elements that I find so intriguing about your work is the difference between content and medium. Your medium is highly controlled and photorealistic. 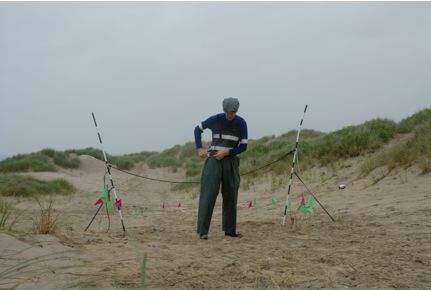 Yet the subject is highly dynamic, people are doing strange things with ropes in holes, water and air. How does Marshall MacLuhan's aphorism "The Medium is the Message" apply to your work? Ethan Murrow: I think media effects and often controls the message more than most would like to admit, but I don't think you can say that it always does. That said, media IS often the overarching structure and also the motivation so it's influence probably outweighs content and concept a lot of the time. For instance, I began these drawing projects in part because of my pure satisfaction with paper, graphite, the atmospheric effect I can create with it, the meditative plodding process, the obsession required and the raw endless simplicity of this approach. But, those things are also very important to me because they relate to my content. Ideas of obsession, perseverance and pig headed-ness are key elements in both media and concept. I like to think the process/media and the content are integrally linked but I do not think one can exist purely without the other and maintain the same effect. In my work content also brought about the media. I aimed to create work that referenced historical documents, black and white photography, monumental glorification and so on. Large scale graphite drawings fit that bill. So the media is at the mercy of the concept too. 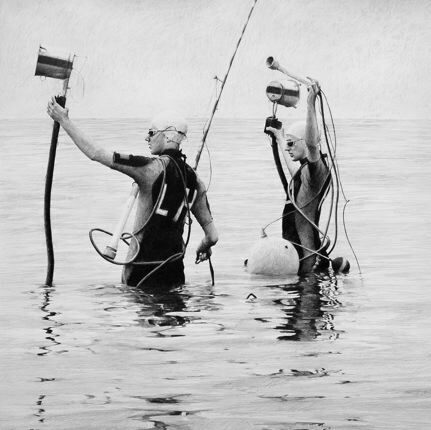 Ethan Murrow, "Off of Gaspé, ready to dive for the elusive whale", graphite on paper 60" x 96", 2007. KB: I am a big fan of mistakes. It's the most exciting and critical part of making art. What is the story within this particular film and how does it illuminate these themes for you? 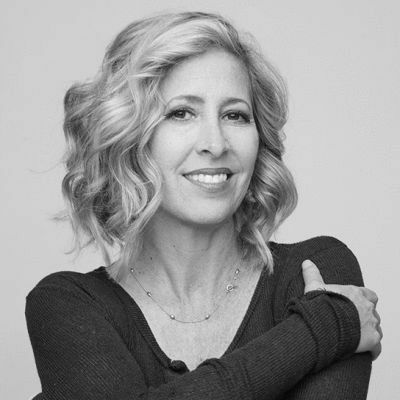 EM: Working with my wife, Vita Weinstein Murrow, a frequent collaborator, a story began to arise from our discussions in early 2006 about two people who had been driven to the edge of their profession and so turned to desperate measures. The characters we had dealt with up to this point were obsessed by fame and glory but rarely had this caused them to swindle anyone. We wanted to dig deeper into failure and investigate what happened to people who had nowhere to turn. The Orson's aren't horrible people, they just use their drive and grit in inappropriate ways. 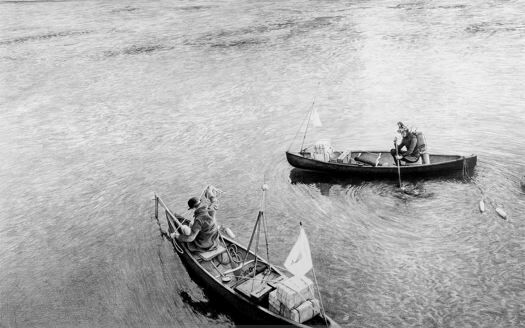 Ethan Murrow, "Cloud Collecting with the Pinto Brothers: at the moment of launch, the quick release jammed and Huffaker lost his cool." 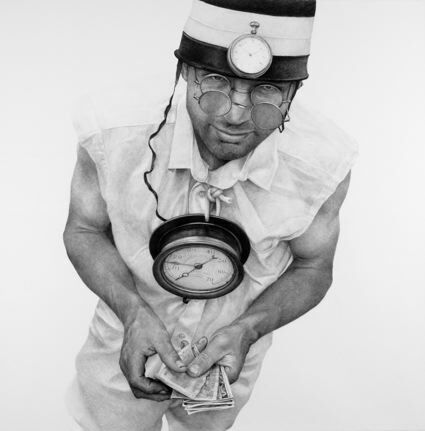 graphite on paper 72"x144" 2006.